You’ve finally managed to have your family over for dinner, and it’s been a fantastic evening. You got to show off your cooking skills, catch up with your children, and even play with your grandchildren. By now, everyone is finished eating and just sitting around the table chatting…except for you. You see, your dentures haven’t fit securely for a while now, so to make sure they don’t unexpectedly fall out, you have to eat very slowly. You can see the kids are starting to get restless because they want to get up, but their parents are telling them to wait until everyone is finished eating. If this sounds familiar, then you’re not alone. Removable dentures typically lose their fit after just a few years, which can lead to all kinds of problems with both eating AND speaking. However, thanks to the latest advancements in dental prosthetics, you can now get a new kind of denture using All-on-4 dental implants that you can trust to always stay in place and give you a smile you can be confident about. The day you got your dentures, they felt really tight on your gums, and you really felt you could bite down and not have to worry about them slipping. Now, you have to be careful with each morsel of food. What happened? When a person loses multiple teeth, the body responds in a multitude of ways. One is that it starts to reabsorb nutrients from the jaw because it knows that there are no teeth for it to support. This, in turn, causes the jaw to slowly shrink and degenerate, which can alter the shape of your gums. 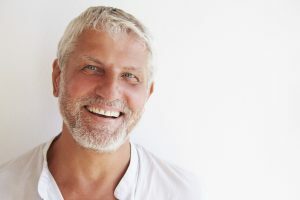 This is why your snugly fitting dentures can start to feel loose over time and why they typically need to be completely replaced about every 5-7 years. Because the prosthetic is anchored to the jaw rather than just sitting on top of the gums, it is much more secure and stable, providing better chewing and speaking function. The implants themselves actually stimulate the jawbone and prevent the degeneration we mentioned earlier. This means they will maintain their fit for much longer in addition to feeling more comfortable. When it comes to dentures, these are real game-changers. When a patient gets implant-retained dentures, they no longer have to worry about the short or long term drawbacks of dentures. Rather, they can just eat, speak, and smile with confidence and NOT have to worry about their teeth. Even better? They are permanent, so patients don’t even have to worry about taking them out to clean them—all they need to do is brush and floss like normal to keep them looking like new for decades. If insecure dentures are affecting your everyday life, All-on-4 dental implants can make a huge difference and restore your missing teeth better (and faster) than almost any other solution available today. Often, an All-on-4 implant dentist can place the posts and the denture in just one appointment. If you’d like to upgrade your dentures and get rid of the cream, simply contact an implant dentist in your area for a consultation, and they’ll guide you through the entire process of rebuilding your smile so it’s both better and brighter for decades to come. Dr. Glen Goldstein, DMD has taken hundreds of hours of continuing education courses dedicated solely to dental implants, and he has used them to help thousands of patients get their smiles back over the years. He currently practices in Randolph, NJ at Randolph Dental Care, and he can be reached through his website or by phone at (973) 895-7995.